What Goes Into Designing a Custom Door Pull? James Padilla, Director of Design & Product Development here at First Impressions International knows the truth inherent in this statement about as well as anyone. As the lead designer, we thought it would be great if James could share some of his expertise and grant some insight into how First Impressions is able to provide the highest levels of customer service as well as meet custom specifications for a variety of projects and designs. With his vast array of knowledge and lengthy experience, Mr. Padilla is the perfect individual to share our process and vision with our current and future customers. With all that in mind, we asked Mr. Padilla to sit down for a Q&A session in order to better illustrate how he arrived at First Impressions and the process that goes into our custom design work. How long have you been designing custom door handles? In general and for First Impressions International? I’ve been designing graphics for about 25 years, and for the past 12 years I’ve been combining graphics with industrial design. Designing door handles for FII is another facet of industrial design and I have done this for the last 2 years. What program do you use for your design work? We mainly use Solidworks for 3 D design, combining Adobe products for rendering and conceptual presentations. What is the average time it takes to finish a customized door handle? 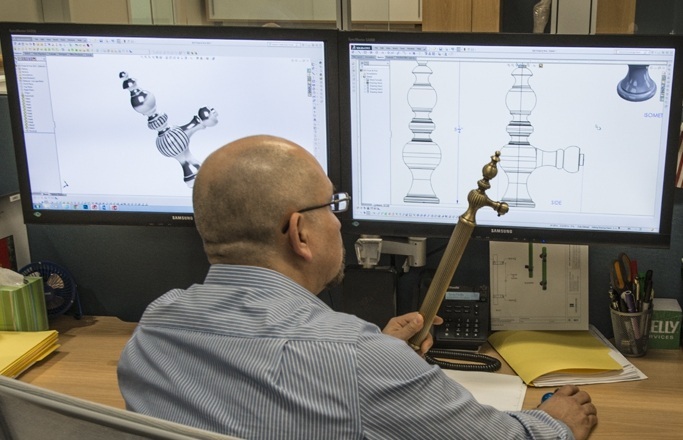 Average time for design on a custom handle is about 1 to 3 hours for average to medium complexity and 3 to 8 or more on highly complicated projects. Can you describe the process you go through when creating a custom door handle design? Gathering all information from clients and sale team. Develop conceptual ideas based on client’s requests. Design the 3D model in Solidworks, develop CAD drawings for submittals. Develop drawings for parts required in manufacturing. What is the most challenging aspect of designing custom handles? One challenging aspect designing custom handles is keeping a balance between ergonomics and aesthetics. What inspires your custom designs? Designing for corporate I like to explore using their logo as handles and possibly incorporate different materials such as Acrylic, Wood, and Leather. Designing new products I get inspired by shapes in nature combined with geometrical shapes. What’s the difference between modern and classic design? Classic design, in my opinion, is very much decorative and not necessarily practical. Modern design looks for simplicity and it’s what I referred to as ergonomically friendly. Do you have a favorite project that you have worked on? Combining metals and wood it is always my favorite, especially when live wood is utilized. Are your designs often detailed from the clients or are you given freedom to design as you see fit? We get both scenarios- some clients are very specific and detailed in their vision and others come with a general concept and allow us to design as we think is best. How has the design world changed since you first began? We have become more environmentally friendly and that is a big plus, not only is this industry but for all aspects of business. Are the design and material interdependent? Are there specific designs that only work with certain types of materials? The answer is yes. We always need to consider application and the durability of the product. What is one piece of advice you would give to someone who wants to get involved in the world of custom design fixtures? Be it door handles or anything else? Keep it simple, practical, and pleasing to look at. Besides that, just enjoy your designs. Check out our array of door pulls or contact us about ordering a custom pull for your business and give James and our team another great project that you can be proud of! !